Technically, my favorite way is still, roasting tomatoes. But, since I saw this post on Epicurious about the beauty of grating tomatoes — to eat right now — I’ve been re-thinking my position on roasting. 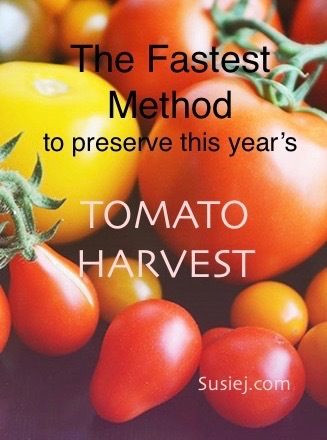 Grating, with the use of some power tools, just may be the fastest way yet to preserve the full flavor of summer-grown tomatoes. Storing grated tomatoes this way, in the freezer, lets me use my new favorite space-saving freezing technique of stacking. The plan, which I’m already using for pesto and my perpetual bone broth, is to fill a ziplock freezer bag with the food, and then to let it freeze flat. The advantage is a very thin layer of preserves that can be easily “broken off” to use as needed. Of course — I did not hand-grate the tomatoes — I took advantage of the bowl on my new favorite tool, the Nutri Ninja Duo. This made a very quick process of the job — which made it much easier to add bits of basil from the garden as the blades chopped the tomatoes and basil all at once. Here is one caveat: Beware — this is the best tomato juice you will ever drink — so make sure you save enough to actually make a bag to go into the freezer.